Ginga has his yakuza (high school) colleagues bring in a pet carrier. Inside is a kitten whom Ginga had found abandoned. Since Nasa loved cats, Ginga figured Nasa could help. Nasa demands Ginga bring the yakuza (school) car around to take the kitten to the vet. There, Nasa tells the doctor all of the exams he wants performed on the kitten. The doctor lets the cat out of the carrier, and it is not a happy cat. As the cat angrily goes off on the vet, Tsukasa notes that its brown fur with a white diamond on the back reminds her of toast. As such, she decides to name the kitten Toast. The pair leave the kitten with the vet and discuss whether to keep the cat or not, should no one come and claim it. They meet Ginga, who’s grateful for them taking the kitten off his hands. He offers to pay for all of the cat’s needs, including food, toys, and cat litter. Two hours later, Tsukasa and Nasa return to the vet’s office. The vet gives the cat a clean bill of health. Having fed the cat, it is no longer enraged. The kitten has no problem being held by Tsukasa, but when Nasa picks it up, it hisses at him. I’ve never owned a cat, but I have frequently kept a cat. 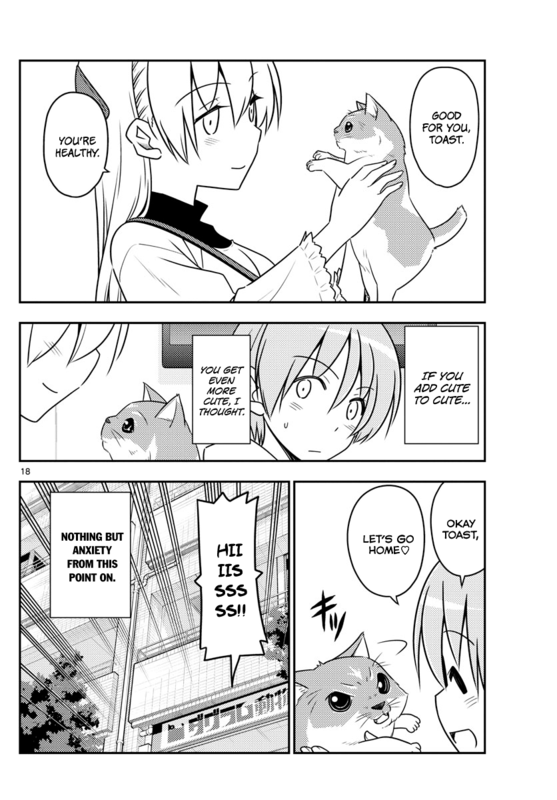 So I can appreciate some hissing cat moments found in Tonikaku Cawaii chapter 51. An angry cat is not a fun thing. When my parents moved to my town so that they could take care of my elderly grandparents, I had to keep their cat for a few months until they purchased their own place. Man, that first night, “Neko-chan” was not amused. I don’t think the cat slept at all as it paced all over. And if I dared approach, I got angry grows and hissing galore. So at the end of Tonikaku Cawaii chapter 51 when Toast decides to hiss at Nasa when he picked the cat up, I couldn’t help but laugh. It does seem that Hata-sensei has a thing for the yakuza. In Hayate the Combat Butler, the yakuza were going to have a bigger role, but ultimately were written out fairly quickly (other than some cameos here and there). In Tonikaku Cawaii chapter 51, we go beyond Nasa’s cousin looking and speaking like a yakuza. We now get to see his “high school classmates”, all looking like yakuza. Even the Sensei looks like a yakuza and is addressed as Ojiki. The word ojiki is actually a term to address an uncle instead of “ojisan”. However, Ojiki is used by the yakuza to address older members of their clan. It is similar to how the family terms Aniki (older brother) or Ane-san (older sister) are used by the yakuza. Anyway, now that Ginga is a member of the supporting cast, I suppose Hata-sensei now has an excuse to have yakuza (or is it Yakuza?) characters around. 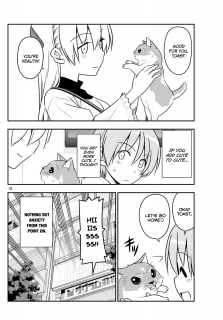 In the end, Tonikaku Cawaii chapter 51 was a fun read, especially if you’ve ever owned or kept a cat. 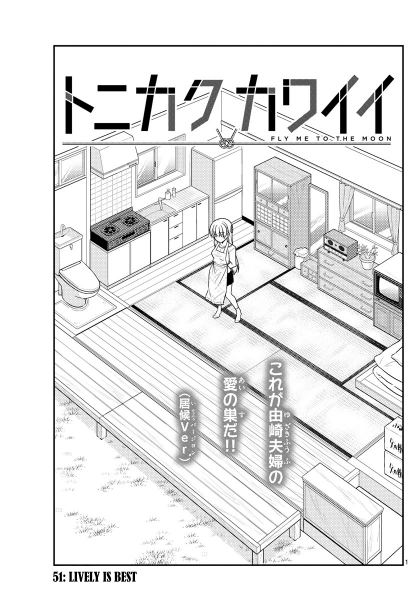 Granted, Hata-sensei’s drawings of Toast are pretty awful, but that’s OK. If he says its a cat, its a cat.